Our product range includes a wide range of bajaj bhu mahashakti bio manure, organic vermicompost, bajaj organic shakti manure and organic earthworm. 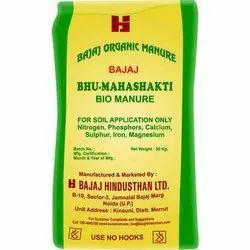 With enriched industrial experience and knowledge, we are providing an excellent quality of Bajaj Bhu Mahashakti Bio Manure. Bajaj Bhu Mahashakti’ is a plentiful source of carbon for the soil beside being rich in NPK (Nitrogen-Phosphorus-Potassium). The use of Bhu Mahashakti balances the soil organic carbon in the soil and thereby preserves optimum productivity and soil fertility. Our offered fertilizers are processed by composting press mud received from cane juice filtration and spent wash received from distilleries. ‘Bajaj Bhu Mahashakti’ is a plentiful source of carbon for the soil beside being rich in NPK. Composting is the biological decomposition of ligno-celluloid organic material into a simple compound, a humus-like end-product called “compost”. It is a rich source of organic manure. It also helps significantly improve the quality of the soil. The process is aerobic which uses various micro-organisms such as bacteria, actinomycetes and fungi to break down the higher organic compounds, like cellulose and lignin's, into simpler substances. The loss of carbon-dioxide and water vapor reduces the weight of the initial dry organic matter. Thus composting reduces both the volume and the mass of the organic matter. Press mud is stored in triangular shaped rows known as windrows. Spent wash is sprayed on each windrow at specific intervals. The windrows are then turned. This helps in homogenizing the entire mass, maintaining uniform temperature and moisture with effective aeration and oxygen supply. Bacteria separate carbon and other complex compounds from press mud and spent wash. Enhancing the effectiveness of this process requires 50-60% moisture. We make available to our clients Organic Vermicompost at industry leading prices. Processed using quality ingredients and latest techniques, it is precise in composition and is very effective in improving the quality of the soil. Available in various quantities, it is one of the preferred choices of our clients. 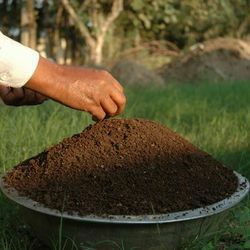 We also purchase organic vermicompost from other sources to cater to the bulk requirements of our clients effectively. In line with clients' diverse requirements across the country, we are offering an enormous range of Bajaj Organic Shakti Manure. Our offered product is the very good source of organic manure. 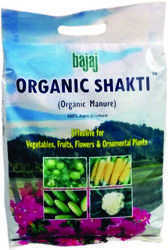 Regular use of bajaj organic shakti balances the soil carbon and thereby preserves its optimum productivity and fertility. This product improves the test, color, size, and number of fruits and prevents the premature fall of flowers and fruits. This fertilizer is extensively used in various farms and barren soils to increase their fertility. Useful of vegetables, fruits, flowers and ornamental plants etc. 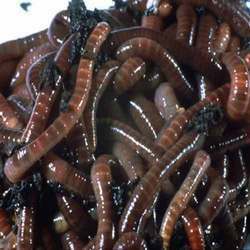 With our expertise in this domain, we also offer Organic Earthworm. In different packaging, we provide the good density of worms. By installing vermicompost manufacturing units, we also offer vermicomposting services. Further, we also hold proficiency in offering consultancy services.